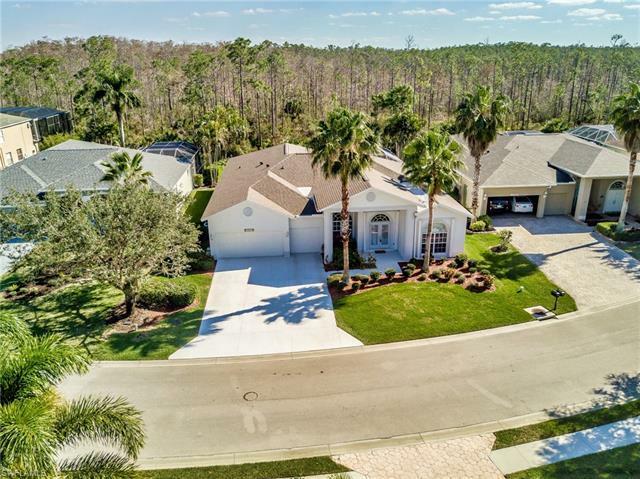 Large 1 story ranch w/oversized driveway, 3 car garage and expansive covered lanai w/pool overlooking beautiful preserve. This home is located on Estate Lot close to a cul-de-sac. New 25 year roof installed September 2017. Storm Smart hurricane protection, including 4 motorized roll down curtains in pool area, accordion shutters all other windows. Large kitchen features Corian Counters, wood cabinets, GE Profile Stainless Appliances including French-door frig w/icemaker, double oven, breakfast nook w/mitered glass bay window overlooking pool! With separate living & family room and den/office, this home offers plenty of space for entertaining & for the family to spread-out. Laundry room has deep sink, built-in cabinets & a second GE Fridge w/icemaker (11/2018) w/5 year extended warranty. Stoneybrook amenities offer something for everyone! Exercise room, tennis, pickle ball, volleyball, basketball, in-line skating rink, bocce ball & baseball field! The golf course is public so you can pay when you play. Conveniently located close to shopping, dining, interstate, beaches, university, Hertz Arena & airport. Low association fees and great amenities make Stoneybrook a popular choice!